These fairy dolls from Barbie: Dreamtopia's Sweetville Kingdom are even sweeter with bubble-making wings! The fun feature is easy to use over and over, because when you enter Dreamtopia with sisters Barbie and Chelsea, you wake up to a world where dreams become reality. Simply pour the included bubble solution into the butterfly-shaped tray, and dip Barbie's pretty, blue butterfly-shaped wings into the solution. Then pull the yellow bow on her belt, and watch as the fan connected to the wings spins. You'll be making giant bubbles as you fly off to the next adventure! 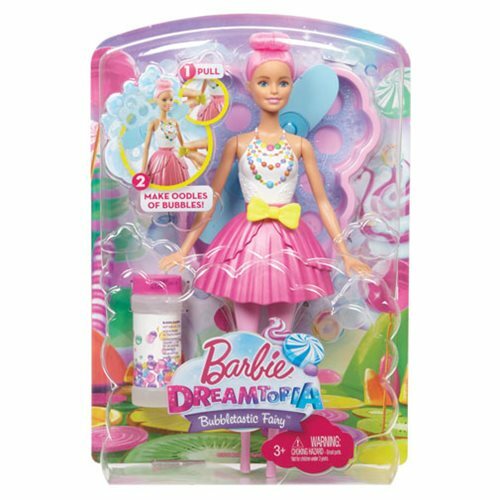 The Bubbletastic Fairy Doll brings Dreamtopia to life wearing a bright dress with colorful candy shapes on her bodice and a pink fairy skirt that matches her vibrantly colored hair. Young dreamers will love adding bubbles to their stories and their play. Collect all the Barbie: Dreamtopia dolls and accessories, and let your dreams take flight! Dolls include bubble solution and a solution tray. Dolls cannot stand alone. Colors and decorations may vary. (subject to change) Ages 3 and up.